Make sure these animals have enough food to survive! If you feed them the wrong food, it's game over. Plan your moves carefully and get the highest score. Puzzle out how to get the tiny swine into the tub full of mud. Clear the way and remove obstacles by using the special skills of other animals. You also can switch your pig's shape to make it roll or stop. Try to reach your target as you pick up all acorns along the way. Much fun with Piggy In The Muddle 3! This hungry pig wasn't careful enough and ended up eating a strange fruit that made him lose his limbs... And he's still hungry! Grab as many sweets as you can and use his only arm to move around the stages looking for stars. Have fun! Help this cute little kitty get his red yarn back - he just wants to play! Break the right rocks and lead the ball to the cat. Good luck! Join the White Rabbit in his journey across the Kingdom to the castle. Collect stars, destroy some obstacles and defeat the evil King in order to rescue his loved ones. Match like-colored octopi in order to make them hug and disappear from the screen! Will you manage to reach the minimum score needed to unlock the next level? Pay attention to the stages and put your senses to test. Have fun! This awesome kitten has started his journey around beautiful Japan! Help him find some delicious food -- get rid of the obstacles in his way and don't let him starve! 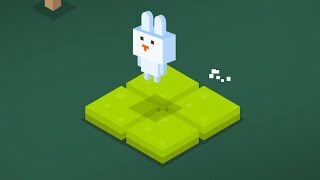 Discover this apparently simple logic-based game where you must turn every tile green so that the bunny can cross above a volcano. Good luck!